Maruti, with the largest share of the market, has been no exception to the threat of rising costs. The September quarter results show that raw material costs, employee costs and other expenses—indicating marketing costs—all rose as a percentage to net sales. It certainly looks as if the Street was not appeased by Maruti Suzuki India Ltd’s operating performance beat for the September quarter. The stock closed a tad lower from the previous day’s trading session at ₹ 6,474, mirroring disappointment on a drop in profitability and pessimism about future earnings growth. Although the Ebitda (earnings before interest, tax, depreciation and amortization) of ₹ 3,413 crore was better than Bloomberg analysts’ average estimate, it came 6.7% lower year-on-year (y-o-y). Added to this was the 160 basis point drop in Ebitda margin to 15.3%, again better than forecasts. The worry on the Street stems from the present gloom due to rising interest rates, fuel prices and commodity cost pressures. The effects have been seen in falling sales volume, although the Q2 numbers may have been impacted partially by the Kerala floods. Even so, September quarter sales fell by 1.5% y-o-y. Discounts were higher too. That said, price hikes taken and new launches were the saving grace that led to a robust 5% improvement in realization. This, in turn, supported net revenue, which rose by 3% from the year-ago period to ₹ 22,433.2 crore. However, the weakness in demand is likely to continue, albeit after some relief during the festive season. Some industry experts see a 15-20% lower offtake in cars and two-wheelers this season. Rising ownership costs may make buyers defer their decisions, given that vehicles are discretionary items in a person’s expense plan. That’s not all. Maruti, with the largest share of the market, has been no exception to the threat of rising costs. The September quarter results show that raw material costs, employee costs and other expenses—indicating marketing costs—all rose as a percentage to net sales. In the analysts’ call, the management reiterated that pressures from both commodities and currency movements could weigh on profitability. The quarter’s net profit fell by 9.6% y-o-y to ₹ 2,245.4 crore, although it was slightly higher than what analysts had expected. On its part, the car maker has been battling challenges to reduce if not eliminate such risks to earnings growth. For instance, about two-thirds of the royalty to its Japanese parent is now paid in Indian rupees, as opposed to Japanese yen. All these adversities in domestic markets and the vagaries in global markets due to currency movements and import restrictions in some countries, may pose a risk to earnings growth in the near-to-medium term. Hence the drop in valuation of the stock over the last few months. 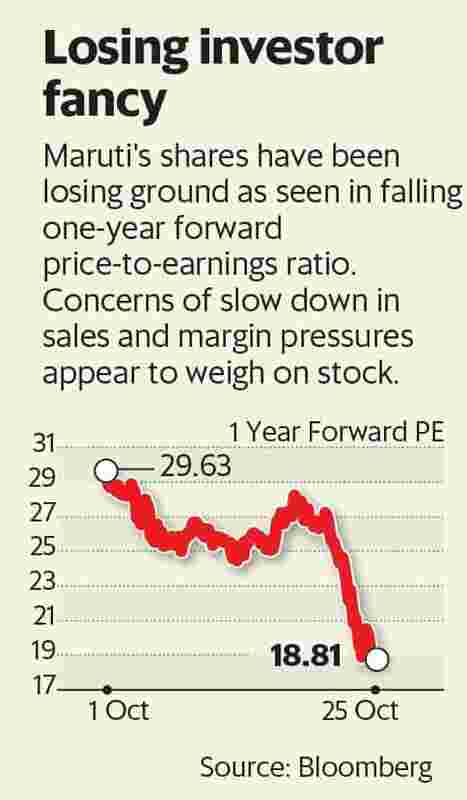 The stock has lost 25% since April even as its one-year forward price-to-earnings multiple tumbled from 26 to 18 during the period (see chart). Indeed, the sharp drop in valuation makes the stock attractive, given that it is the largest car maker and a proxy for investment in the country’s auto sector. However, investor appetite will ride largely on the sales trend in the coming months.